One month ago, I submitted the paperwork for my very own company. 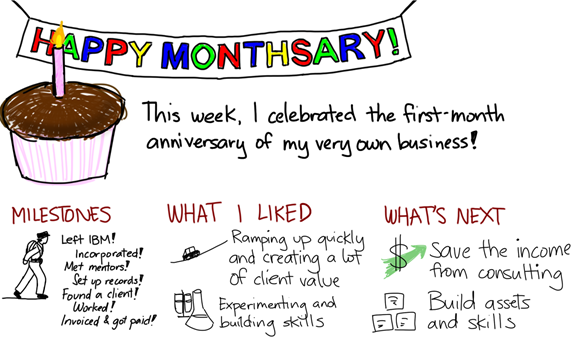 I talked to mentors, set up my accounts and records, found a client, and started doing consulting. I drew some book notes and presentation summaries, too. =) So far, so wonderful! I went to the Rails Pub Nite on Monday. The events are good opportunities to catch up with many of my friends in Toronto’s tech scene, and I often pick up one or two technology tips along the way. This time, I told my friends how I’ve been dividing my time between creating single-page visual summaries of books and offering consulting in enterprise social software adoption. “Ah, the work that pays the bills,” someone said, nodding knowingly. I stopped, thought about it, and realized that I approached things differently. Because I planned this as a 5-year experiment enabled by low expenses and savings, I don’t look at consulting (or development, or whatever else) as the stuff I have to do in order to pay the bills so that I can do the “fun” stuff. This consulting is fun too. The income extends the experiment and allows me to try other things, but is not essential. It’s surprising to find myself wandering down the drawing path instead of, say, taking advantage of the demand for Drupal or Rails skills. Drawing is fun, though, and there’s something here that makes me curious. I know I can pick up development again whenever I want to, so I’ll play around with this completely different set of skills for a while. Who knows where it will lead? I still don’t have a company name, but doing business as a numbered company seems to be totally fine for now. I’ve got money saved for taxes and most of the accounts set up. Yay!